The disgraceful recent Facebook attack on the nationalist hero Veer Savarkar by the Congress Party raises serious questions about its descent into moral bankruptcy and political shambles under its current leadership. The shocking Congress assault suggests that it may have been infiltrated by foreign interests seeking to poison Bharat, by assailing its sense of self. It is unthinkable that Indira Gandhi, who was hailed as Durga by L. K. Advani after her historic display of courage and honour in liberating Bangladesh, would have allowed such attempts to undermine the foundations of the nation’s self identity. Abusing a nation’s idea of its self is an old stratagem that colonialists and imperialists routinely use to undermine its sense of self and its pride. And Congress behaviour since the accession of a foreign-born ruler and utterly corrupt associated family suggests something truly sinister is afoot. Its heir apparent had slyly denounced Bharat’s Hindu people to the US ambassador as the real terrorists, and his intimate advisers have lined up to exonerate Pakistani terrorists, suggesting the Batla House and Ishrat Jahan encounters were staged and apparently assenting that the unprecedented 26/11 murderous assault on Mumbai was the handiwork of Hindus. Unsurprisingly, today’s Congress heroes are the pathetic Kanhaiya Kumar and the profoundly anti-national academic Nivedita Menon, calling for the dismemberment of Bharat. Most shocking of all, Congress failed to understand the seriousness of the abuse at JNU of the most sacred of Hindu deities, the goddess Durga, as a whore. Compared to such egregious animus towards the very foundations of Hindu Dharma and the nationhood of Bharat’s people the sordid attack on Savarkar’s reputation is, as they say, small beer indeed. Oxbridge degrees are apparently no longer quite what they used to be, though the Nehru family bahu acquired proficiency in English in a dubious one-room Cambridge attic providing the basics for waitressing! But a Cambridge MPhil doesn’t seem to amount to much either nowadays, but the college was headed, during Rahul’s supposed sojourn, by a pompous Bharatiya self promoter, not quite the real thing perhaps! Of course Oxbridge and other British academic institutions now stand accused of anti-Semitism, and hostility to Hindus barely lurks below the surface. Defenders of stoning to death were given a platform at Oxford, but Dr Subramaniam Swamy, Rajiv Malhotra and I were declined the opportunity to talk about the Bharatiya economy! The PM of Bharat was turned away by Cambridge. Real academic training teaches how to read documents and understand their underlying significance and meaning. The plea for his early release, penned by Veer Savarkar to the British authorities, is a pro forma statement that is in the standard form of words for such an endeavour, though Savarkar’s one has an exaggerated tone suggestive of sarcasm and mockery! In fact, the great revolutionary martyr Sachindranath Sanyal had given similar undertakings to the British authorities and Sanyal felt that Savarkar’s plea was refused because he was considered a particular danger for civil peace in Maharashtra. Sanyal himself promptly reneged on the undertakings he had given to attain his own freedom and suffered imprisonment for life once again shortly. In any case, of necessity, the technical legal prerequisite of such pleas by Savarkar and Sanyal was an affirmation of peaceful conduct in the future and loyalty to the established power, which they had to provide and did. But there was nothing compromising in the political calculation of such appeals for clemency since it was well understood that for nationalist leaders to languish in prison was the least productive outcome for the freedom struggle. There is nothing of any significance in Savarkar’s plea for early release that can be used to libel this great man. His record of unceasing struggle for his country and civilisation has become a source of pride and inspiration for subsequent generations. His puny and ignorant detractors will also be remembered, but only for their trenchant mediocrity and gross criminality. In his plea for early release Savarkar seems to be accepting, on the face of it, Gandhi’s view that the British were to be ejected from Bharat peacefully. Ironically, the statement of Bhagat Singh used by Congress in the Facebook libel to demonise Savarkar, by attempting to use the fates of two of Bharat’s greatest heroes against the other, proposed the violent alternative of Subhas Bose that Gandhi and Nehru disavowed. These half wits also seem to be clueless of the harsh conditions of Savarkar’s incarceration and the prospect of his wasteful death without emerging to play any role in the nation’s freedom and building he had spent his entire life striving for, as even Mahatma Gandhi had recognised. Instead of the personal gratification of supposed reputational integrity Savarkar chose the politically wise path of attempting to gain freedom to serve the motherland. The gross criminality of the Congress party is not just about the astounding theft of national resources that virtually destroyed Bharat’s economy. It also pertains to the evidence, as yet unpunished, of violations of Bharat’s Constitution in subverting parliament and the office of prime minister. The President of the Congress, having failed to seize the highest political office of the land by subterfuge because the nation’s titular head blocked her path, created an alternative structure in a so called National Advisory Council that dared to supplant the Government of Bharat. Indeed the Congress President and her handpicked prime minister should have faced summary arrest for abuse of office, nay treason, for allowing prime ministerial files to be handed over to her. This woman still leads the wretched Congress! 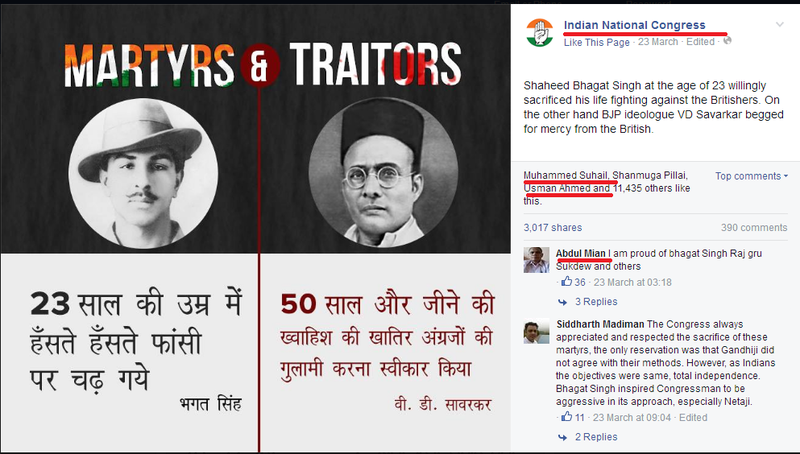 And these people dare attack Veer Savarkar?